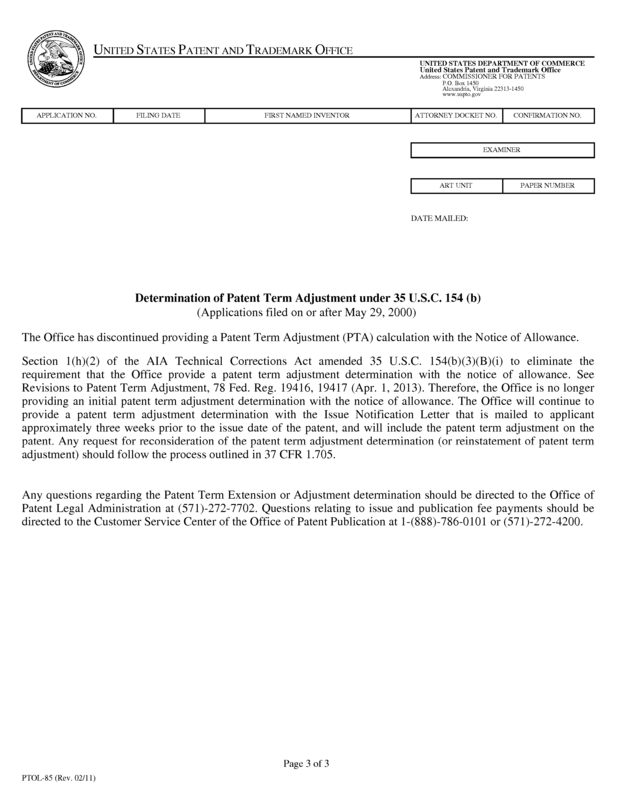 (a) If, on examination, it appears that the applicant is entitled to a patent under the law, a notice of allowance will be sent to the applicant at the correspondence address indicated in § 1.33. 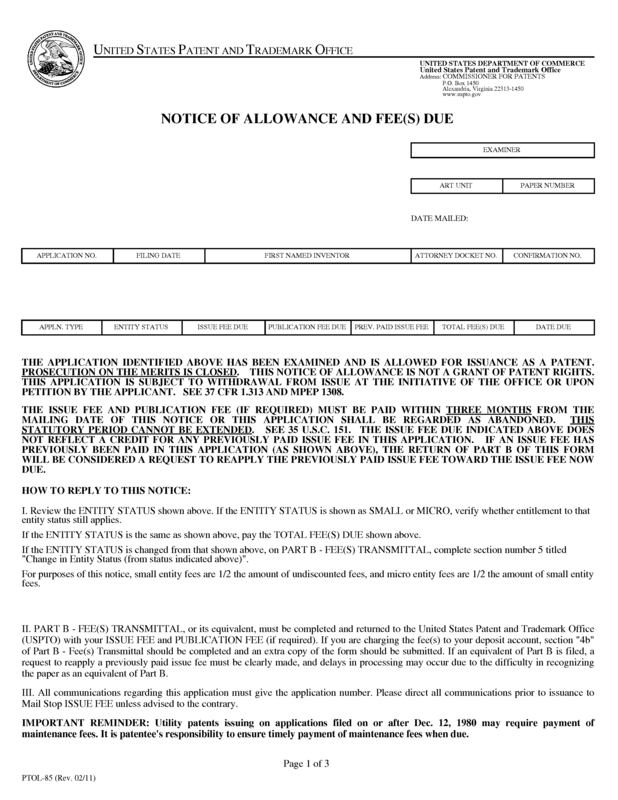 The notice of allowance shall specify a sum constituting the issue fee and any required publication fee (§ 1.211(e) ) which issue fee and any required publication fee must both be paid within three months from the date of mailing of the notice of allowance to avoid abandonment of the application. This three-month period is not extendable. A Notice of Allowance is prepared and mailed, and the mailing date appearing thereon is recorded in the image file wrapper table of contents. If an application is subject to publication under 37 CFR 1.211, the Notice of Allowance will require both the issue fee and the publication fee. See 37 CFR 1.211(e). It is noted that the publication fee was reset to $0.00 effective January 1, 2014. See Setting and Adjusting Patent Fees (78 FR 4212, Jan. 18,2013). A "Notice of Allowance and Fee(s) Due." (PTOL-85) will be mailed to the correspondence address of record. The form includes the amount of any required publication fee, as provided in 37 CFR 1.211(e) and 1.311. The form includes an indication that the publication fee is due, if the application was subject to publication and the publication fee has not already been paid. 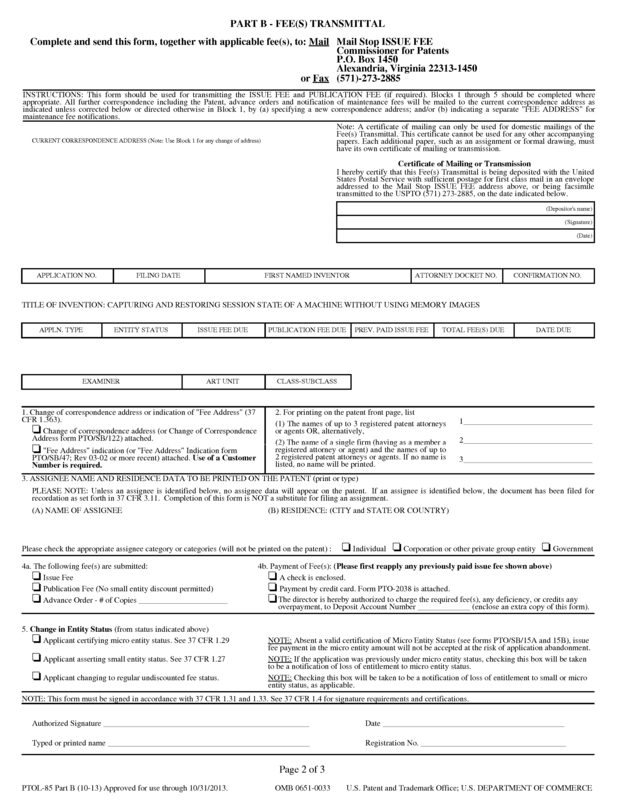 Part B of the form (PTOL-85B) must be returned to the Office with the payment of the issue fee. Applicants are reminded to transmit an extra copy of the PTOL-85B when payment of the issue fee is by way of authorization to debit a Deposit Account. See MPEP § 509.01. For more information about eighteen month publication and publication fees, visit the USPTO Internet web site at www.uspto.gov. 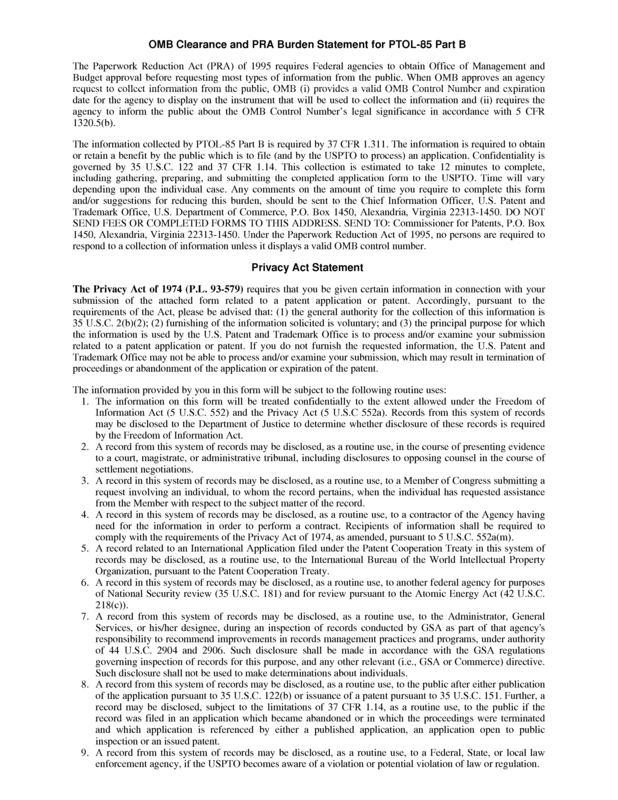 For applications filed on or after September 16, 2012, if an application is in condition for allowance but does not include an oath or declaration in compliance with 37 CFR 1.63, or a substitute statement in compliance with 37 CFR 1.64, executed by or with respect to each actual inventor, the Office will issue a "Notice of Allowance and Fee(s) Due" (PTOL-85) together with a "Notice of Allowability" (PTOL-37) including a "Notice Requiring Inventor’s Oath or Declaration" (PTOL-2306) requiring the applicant to file an oath or declaration in compliance with 37 CFR 1.63, or substitute statement in compliance with 37 CFR 1.64, executed by or with respect to each actual inventor, no later than the date of payment of the issue fee to avoid abandonment. If applicant receives a "Notice Requiring Inventor’s Oath or Declaration" and fails to file a proper reply to the notice before or with the payment of the issue fee, the application will be regarded as abandoned. See 37 CFR 1.53(f)(3) (ii).